Shariah – Islamic Law. This is not a man-made law that can be negotiated or amended without reference, discussions and decisioning based on the primary sources of law i.e. Quran and Saying of the Prophet p.b.u.h. Fiqh Al Ibadah (rituals) – Laws regarding prayers, behaviours and beliefs. Fiqh Al Muamalat (transactional law) – Laws regarding the economic rules for transactions and providing services. Issues regarding the involvement in Riba’, and other prohibited elements in an economic transactions (including May’sir, Gharar, cheating, fraud). Fiqh Al Qada’ (laws to administer justice/ Judicial system) – The goal is to achieve “justice“. Dependence on the Islamic references, Judges (qualification and code of conduct), jurisdiction, role of witness (Islam prohibits attempts to block truthful witnesses, or wrongful testimony under oath), Type of Proof. Completeness – Declaration by God that the religion is complete, by providing the Quran which covers all aspect of life (self, family, society, country). Universality – In line with the universal principles of “nature” (fitrah). It takes into consideration the views of others (other race, religion, creed and social standards). Mutual consultation (Shura’) is encouraged, and discourage repression (slavery, torture, inhumane treatment). Flexibility – While there are some restrictions imposed by the Quran, there are also specific dispensation the rule, for example the prohibition to eat swine meat but exception when for severe hunger with no inclination to sin. 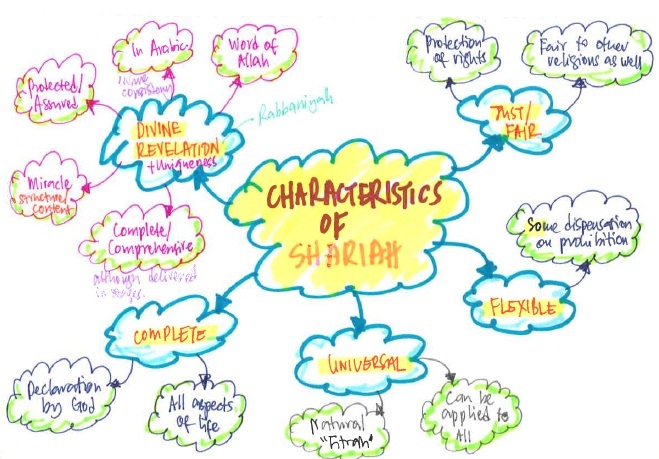 Just/Fair – The principles of justice and fairness must be the underlying principles of Shariah to ensure the rights of people are protected and defended. It must also be applicable to all creed and races, as well as practitioners of other religion. 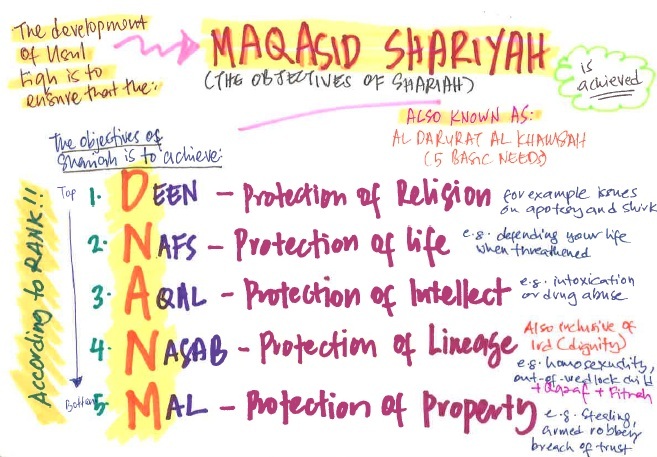 Al Nafs – Protection of life. For example the issue requiring to defend your life when threatened. Al Nasab / Al Nasal – Protection of lineage. For example abortion or procreation (in cases for homosexuality), khalwat (in cases for children outside marriage), prevention of bodily harm/injury. Al Mal – Protection of property. For example Stealing, armed robbery, breach of trust.